WEST BLOOMFIELD — What if a musi­cal instru­ment you owned was the only one of its kind? That is the case with the organ in the West Bloom­field Con­gre­ga­tion­al Church. Made by the W.J. Davis Co. of Buf­fa­lo in 1875, it is the only known organ still in exis­tence built by that organ mak­er. This Sat­ur­day, a cita­tion from the Organ His­tor­i­cal Soci­ety will hon­or the instru­ment dur­ing a cer­e­mo­ny at the church. The inter­na­tion­al soci­ety is hold­ing its annu­al con­ven­tion in Rochester, and mem­bers will be vis­it­ing organs through­out the region. 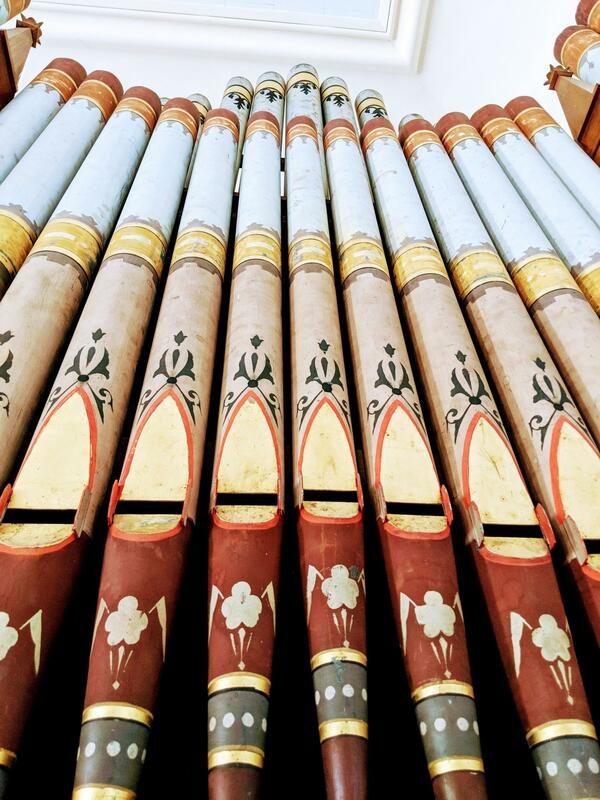 Its mem­ber musi­cians, organ builders, his­to­ri­ans, schol­ars and music lovers cel­e­brate, pre­serve and study the pipe organ in Amer­i­ca in all its his­toric styles. Besides the West Bloom­field church, the Avon Methodist Church, which owns an A.B. Fel­ge­mak­er Co. organ dat­ing to 1895, is also receiv­ing a his­toric organ cita­tion. “As part of the cita­tion, we have promised to keep the organ in good repair and not do any dra­mat­ic ren­o­va­tions that would dam­age its his­toric val­ue,” said the Rev. Corey Keyes, pas­tor of the West Bloom­field church, of the instru­ment not­ed for hav­ing excel­lent tonal and mechan­i­cal preser­va­tion for its age. Since 1975 the Organ His­tor­i­cal Soci­ety has been rec­og­niz­ing excep­tion­al­ly impor­tant and note­wor­thy instru­ments with cita­tions. Some of the most cel­e­brat­ed organs in the world have been hon­ored and pro­tect­ed by these des­ig­na­tions. More than 400 instru­ments have been rec­og­nized — includ­ing those in the Mor­mon Taber­na­cle in Salt Lake City and the Memo­r­i­al Art Gallery in Rochester. “We are being includ­ed in some rather lofty com­pa­ny,” Keyes said. The Davis organ was installed in 1881 at the West Bloom­field church soon after the cur­rent build­ing, its third, was com­plet­ed in 1875. 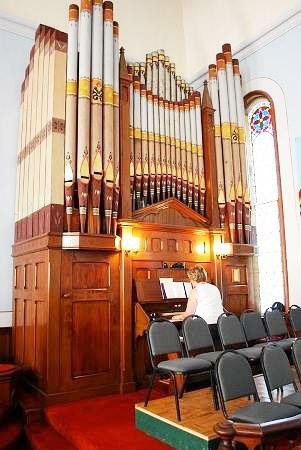 “The organ is an antique, push­ing 150 years old,” said Paul Hud­son, the church’s finan­cial team leader. Records show that a mule train brought it from Buf­fa­lo at a freight cost of $12. The instru­ment fea­tures an ornate incised hard­wood case. The paint­ed dec­o­ra­tion and gold leaf on the pipes are con­sid­ered to be orig­i­nal. “Every­one on the OHS committee is very excit­ed that we’re able to rec­og­nize such a spe­cial organ dur­ing our annu­al con­ven­tion this week,” said Mar­garet-Mary Owens, a grad­u­ate stu­dent in organ per­for­mance and lit­er­a­ture at the East­man School of Music. She is among a hand­ful of stu­dent vol­un­teers who helped with con­ven­tion plan­ning. She reached out to those church­es with his­toric organs believed to be in orig­i­nal con­di­tion. “When we say ​‘orig­i­nal con­di­tion’ we mean its mechan­i­cal and tonal aspects are not changed. The case, pipes, stops, and trac­ers are all orig­i­nal,” Owens said. Those parts made of leather and felt wear out and are nor­mal­ly replaced every 20 years. Over the years there has been the need for repairs to the West Bloom­field organ and they can be cost­ly. This spring, Hud­son said an anony­mous donor made it pos­si­ble to repair the oboe sec­tion and the tremo­lo mech­a­nism. “The organ is the church’s biggest phys­i­cal asset and may be worth more than the church build­ing itself,” said Hud­son, who cites the replace­ment val­ue as $400,000 to $500,000. 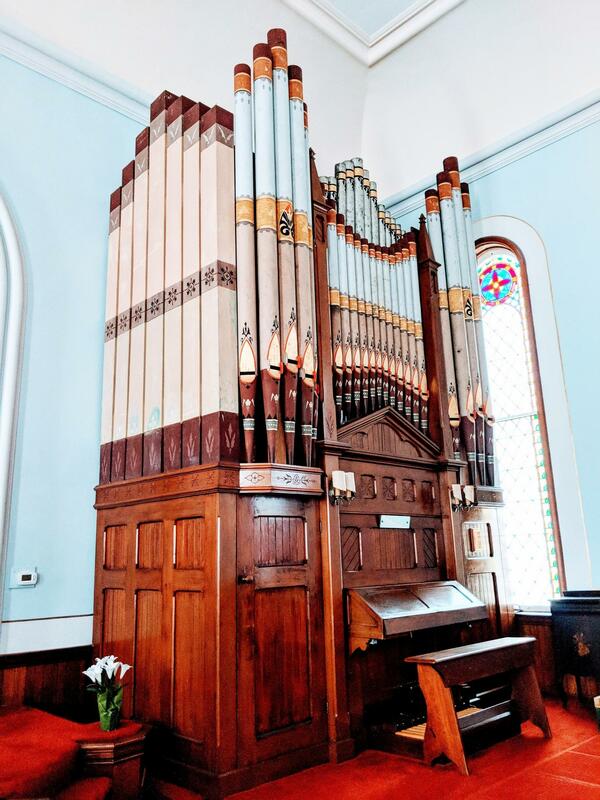 “The organ has a mag­nif­i­cent sound — full and pow­er­ful when we pull out all the stops, yet she can be soft and ten­der while still fill­ing the sanc­tu­ary with music,” said Andrea Stein, one of WBCC’s two organ­ists. Stein alter­nates play­ing it with Sue Belch­er. Begin­ning about 30 years ago Stein job-shared with her mom, Kay Char­ron, until Stein went away to col­lege. Char­ron actu­al­ly began play­ing the organ when she was 12. “I think she was prob­a­bly get­ting tired of play­ing every Sun­day after all those decades and want­ed a way to have a few weeks off,” said Stein, with good humor. A com­plete list of organ cita­tions award­ed by OHS can be found here.